The Kikusui PWR800L is available to buy refurbished used or rent, usually from our UK stock. Click here to download the Kikusui PWR800L datasheet. The PWR800L is a 800W DC power supply, capable of up to 80V / 50A, within the 800W limit. Full OCP / OVP plus front and rear output connectors. 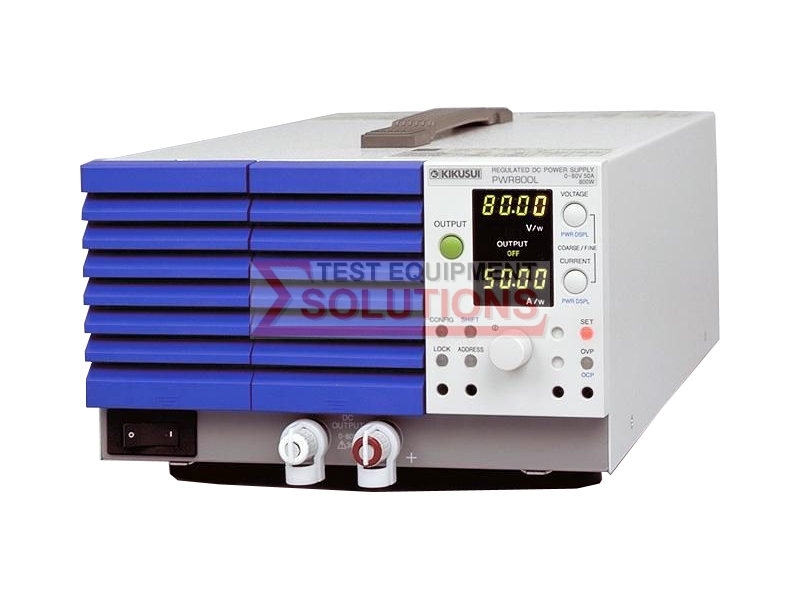 We offer the refurbished used Kikusui PWR800L 80V 50A Power Supply 800W for sale and rental. The Kikusui PWR800L is fully tested and refurbished in our in-house ISO9001 calibration laboratory. We supply manuals, accessories, full warranty and a free-of-charge Certificate of Conformity. We can also provide the Kikusui PWR800L with a fresh calibration for a small additional charge. If you have under-utilised test equipment talk to us about trading-in or part-exchanging it towards the Kikusui PWR800L or other refurbished test equipment.